Walmart has come under attack from labor monitors over the burnt-down garment factory in Bangladesh, which was producing clothes for America’s largest retailer. The company took an evasive position before finally claiming violation of contract. ­On Monday The Nation magazine published photos of charred clothes found in the ruins of the factory with easily-recognizable Faded Glory labels associated with Walmart. In an interview to The Nation, Executive Director of the Worker’s Rights Consortium Scott Nova accused Walmart’s business model of creating deadly labor conditions in Bangladesh and named the horrible fire as the direct consequence of that model. Nova, who represents the WRC group that monitors labor worldwide, said that Walmart’s seeking out the “cheapest possible labor costs” in Bangladesh is one of the major reasons for the tragedy. Since the retailer is the largest buyer from Bangladesh it “makes the market” and bears responsibility for what goes on clothing factories in Bangladesh. Immediately after the incident, Walmart issued a statement that it is determining its current relations with the burnt factory, calling fire safety a priority for the company. Walmart’s spokesperson told the New York Times it is “unable to confirm” whether the burnt factory was supplying any goods to Walmart. Now Walmart insists its supplier from Bangladesh, Tuba Group, which owns the Tazreen Fashions Ltd. factory, violated the contract by passing production to a subcontractor. Walmart says the factory was producing clothes for them without the knowledge of the retailer. The contract with the supplier has been terminated immediately. “We have terminated the relationship with that supplier,” continues an official statement of the US biggest retailer issued on Monday. The retailer also promised to intensify work with the apparel industry to ensure an acceptable level of fire safety in Bangladesh. Scott Nova said the death toll in Bangladesh is likely to continue growing since Walmart has no intention to cause obstacles to its supply chain in Bangladesh. “The only way factories in Bangladesh can survive, given the prices that the Western brands are willing to pay, is to operate unsafely,” said Nova. 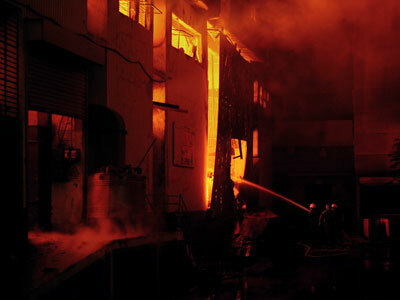 Clothing factories in Bangladesh are notorious for total negligence of elementary principles of fire safety. 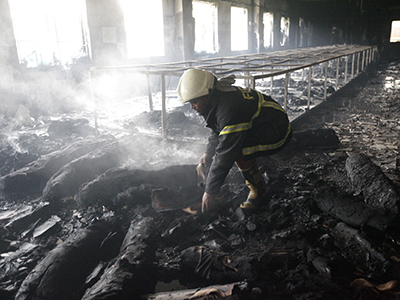 Some 315 people died since 2006 because of numerous fires at the apparel industry factories. 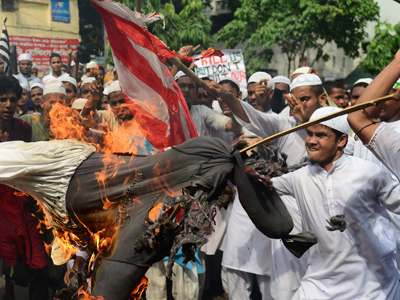 The deadly fire in the country’s capital Dhaka has sparked mass protests of thousands on Monday. Up to 15,000 demonstrators took to the streets, demanding the government take action against factory owners who disregard fire safety as an unnecessary running cost. The protests forced some 200 clothing factories to close. 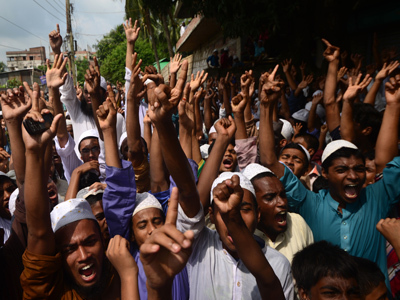 Protesters gathered at the ruins of the burnt factory in Dhaka’s suburb of Savar. They blocked a major highway, smashed vehicles and threw stones at the factories. On Tuesday the government announced a day of national mourning due to the incident. National flags flew half-mast in all government buildings. All clothing factories in the country stayed closed. Exports of ready-made clothing, garments and textiles make up to 80 per cent (over US$20 billion) of the total exports of Bangladesh. The country has more than 4,000 clothing factories. Bangladesh textile industry employs over three million people, 90 per cent of whom are women. Up to 95 per cent of the apparel enterprises in Bangladesh belong to the citizens of the country. 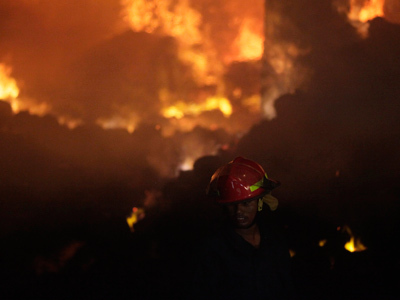 In the meantime, police in Dhaka suspect the fire was caused not by a short circuit, but by arson carried out by a local woman, occasionally recorded by CCTV cameras. The woman, who also tried to set on fire another factory, was reportedly arrested. The fire at the eight-story building of the apparel factory started on the first floor, quickly cutting off all three exits from the building. Survivors stated later that at least one exit was locked, while no emergency exits existed in the building whatsoever. In absence of a central fire-extinguishing system, portable fire-fighting appliances turned out to be out of commission, present only to impress firefighting inspectors. Moreover, when the fire alarm went off, the shift supervisors told seamstresses to return to their sewing machines. Some people tried to escape the fire by jumping out of the windows of upper floors – many of them died. Others choked to death in the thick smoke of burning fabrics. Many of the bodies the firefighters found in the ruins were burnt beyond recognition. Later it was estimated that up to 1,000 people could have been inside the building when the fire started. 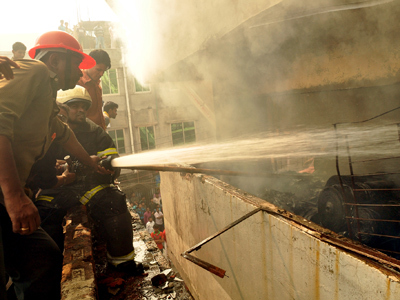 According to the most recent official figures, the number of victims in what became the deadliest fire incident in years in Bangladesh has reached 112. Dozens more were injured.